A classic tawse made in the style of the original as handcrafted by A B Dicks in bye gone days at Lochgelly Scoltland. This version of this classic Scotish and Irish Schools punishment strap is made from dense but supple thick brown leather that wraps round the shape it strikes (delivering a uniform stroke). Our leather has a special finish that can be oiled to give the tails extra weight for a much harder stroke,or it can be soaked in water to achieve one of the severest lashes possible from a leather tawse, do not be fooled into thinking that this item is a toy. This item has an authentic curved handle grip as per the original pattern, with a special hanging hole provided in the correct place. This tawse is the rare three tailed version, which was a widely used strap for both sexes in state run and church administered schools. This tawse is divided into three tails that mould to the shape of the recipiants body at the point of contact. 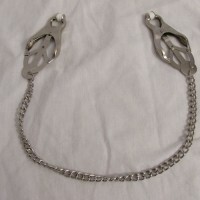 A classic style of school strap extensively used for punishment and class discipline. Ideal for any naughty boy or girl in need of hard chastisement.